Having a baby is one of the most wonderful, exciting, life changing events of your life. It might be a daunting and overwhelming journey, especially for first-time parents. To empower all new mothers, we have prepared key topics such as Essential Tips for New Parents and Breastfeeding Tips to prepare you for motherhood in our upcoming seminar. Join us at “All Things Confinement” for an engaging afternoon where you can pick up essential tips from our panel of maternity experts from Thomson Medical. Learn more about Fundamentals of Easy Trimesters and The Do(s) and Don’t(s) for Confinement Practices to keep your jitters at bay. Our friendly staffs will be around to share with you more information on hospital admissions, confinement nanny services and wellness programmes to guide you through this journey. 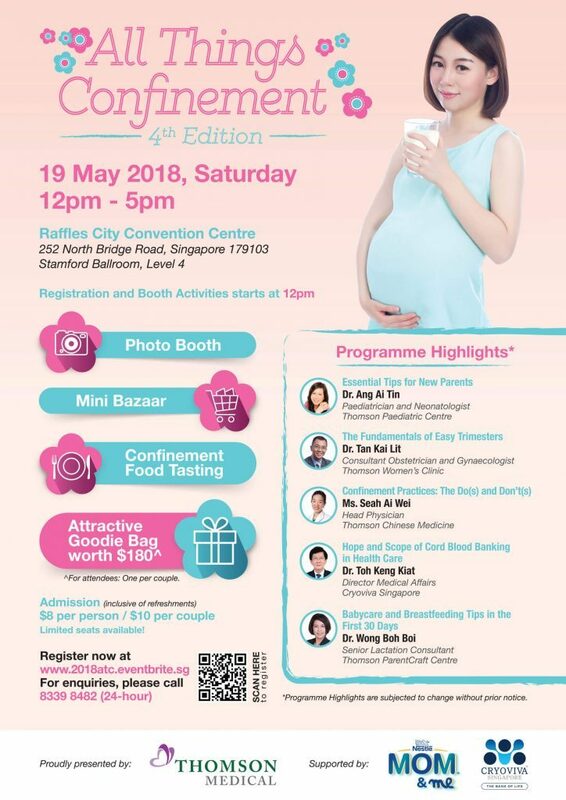 You will also get to enjoy a complimentary Confinement Food Tasting session and receive a goodie bag worth more than $180! Sign up now and see you on 19th May 2018, Saturday!